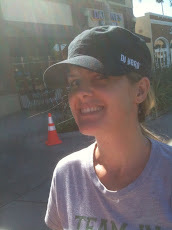 What does the movie Moneyball, the song Perfect by Pink and a 5K in Agoura have in common? Other than this post, probably not a lot of things. For me, though, they all led me to put words to something I have been struggling to write. At one point this post was written to a series of people……….my son included. Recent events though have me focusing this entry on Jaden, my amazing 7 year old best buddy. This post will be a mess of thoughts that are in my head. They may make no sense to anybody but me but they are eating me up and I need to get them out of my head. I always refer to Good Plus One as a blog but to be honest with myself, I think it is hardly that. I am not sure what a ‘blog’ technically is but I imagine the definition involves a frequency of writing far more than I contribute. I started this site to track my wife’s second battle with cancer. I certainly have utilized it to help fight back against that cancer, the cancer that took my father’s life, the cancer that attacks my friends (both virtual and real life) and the cancer that looms out there waiting to attack any one of us. This site is also a place for me to go when I want to write………….I have hopes of writing a book one day. This site gives that hope……..well, hope. My life is insane. Time to write is not abundant. I rest easy, though, knowing I have a place to go when time permits itself. I would also like to think this site is a source of motivation for some. If it is not, I would like it to be. I would like to inspire people. I would like to get people off the couch for whatever reason that put them there. I would like people that have lost their way to read my words and find direction. I would like people that doubt their ability to find some faith and reach……….well, beyond their reach. I want people that doubt their ability to make a difference to know changing the world is a real possibility. Although self-serving, I think Good Plus One is also here to help make me a better person. By putting my thoughts on paper, I center myself and make sure I am being the best person I can be. I have somewhat of a photographic memory (although I think it is fading a little bit with time). What I see on paper, I internalize. In college, I would write notes for a test in tiny print on one sheet of paper. When I would take the test, I could see the answer to the question on that sheet of paper as if it were sitting in front of me. Seeing my words and my beliefs and what is right on a sheet of paper commits them to memory and assures I try to live each moment to the best of my ability. At the very least, I would like this site to be a place my children can one day go and understand what is going on in their Dad’s head. I, of course, hope to teach them that face to face but there are things going on today that a 4 year old and 7 year old certainly will not understand. On Sundays, for example, my children know they will wake up and Dad will not be home. They know I coach a team and I can certainly explain ‘why’ I coach but there is no way they understand all the nuances of what coaching for Team in Training and fighting cancer represent. My son Jaden is starting to understand what I do tied to a recent reunion with one of his school friends named Eliot. You see, Jaden’s friend has been very sick and because of that has been in and out of school. Oddly enough and sadly enough, the sickness that keeps Eliot out of school is leukemia. Jaden knew this but recently put 2 and 2 together to realize that leukemia is why he will only know his grandfather (my father) through photographs and stories. How do I know that Jaden finally understands the evil that cancer is? Well……after that reunion with Eliot, Jaden came up to me later in the day to ask me a favor. He said “Dad, I know you have a team and I know that Eliot has what your Dad had and I know that your Dad died from what Eliot has.” He then asked me a question that dropped me to my knees………”Dad, can you please save my friend?” My eyes water just thinking about that interaction. All I could tell my son is that I was…..and would continue…… to do everything in my power to save his friend. Today this post is not about fighting cancer (although I always accept donations). It may not motivate anyone other than myself and I am okay with that. It is written for my son Jaden and it is written in the hope that his Dad becomes a much better and understanding father. Ever since Jaden was born, I wanted to write for him…………I wanted to write to him. I wanted to share all the thoughts I had watching him grow up………the good and the bad. I wanted to share my thoughts when I heard him talk for the first time, saw him laugh for the first time, saw him take his first steps, saw him get 100% on a spelling test for the first time, saw him get his first baseball hit and saw him cross his first 5K finish line. I also wanted to share my thoughts watching him struggle as a little boy to make friends………something that was tough for me as a kid too. Jaden was very sick as a baby and had to be isolated from other children for the first 3 years of his life. This isolation created some difficulty with social skills which, I believe, still affects him today (I am not saying Jaden lived in a bubble but his exposure to other kids was greatly reduced). I wanted to put to words my apologies for being an overprotective Dad. I have a good excuse for that. Before Jaden was born, my daughter Isabella passed away. When you hold your child in your arms and that child is not breathing…………it is tough to overcome and tough for the children that follow. I try to adapt. I try to get stronger. I am getting better but I have a ways to go. Anyway, my hopes to write for Jaden never transpired. I still have the journal I purchased for that very purpose but it lays blank by my bedside as a reminder of time lost. When my son finally grew out of his horrible allergies and was allowed to enter the free world with the rest of the children, things were a bit challenging for him. He did not know how to share because he never had to share. It wasn’t that he was selfish, it was simply that he had never interacted with other children before. He was thrown into a foreign environment and it was tough to watch him struggle. I remember taking him to the park. He would try so hard to get someone to play with him, so hard to have someone be his friend. It was always awkward and it was rarely easy. As his Dad, I just wanted to make everything all right. I wanted him to feel accepted and loved. Jumping ahead to present day, that is where I find myself as I write this entry. I want to make everything okay but this time it is a little more than just making friends. Time passed and Jaden went to preschool. Things got a little easier but Jaden struggled to make it through each day without trouble. He was wicked smart but troublesome and it took a lot of patience on behalf of the teachers to deal with him. I always attributed these things to his first years of separation but every once in a while I would muster the question to my wife about whether she thought he might have Attention Deficit Disorder. Truthfully, I didn’t know what having ADHD meant but I do know that I feared the answer every time I posed it. My wife would always assure me things were okay and we would move forward in time. Jaden made it to Kindergarten and was blessed to have an amazing teacher. He dealt with many of the same struggles but this is the first time somebody used the word ‘gifted’ to describe my son. Gifted was a word I could deal with. Gifted is something that made sense to me because he was so very smart. I figured that my son must simply be bored because the work he was being asked to do was so easy for him. I liken the way Jaden acted to Chapter One of the Steve Jobs book where Steve would keep getting in trouble at school because the school could not keep his interest. Somewhere along the way I am sure I asked my wife the ADHD question and then tentatively moved past it hoping it would fade into the distance. In my mind I always use the 3 years of separation that started my sons life as the reason for all of this. I know this excuse will not always be allowed. At 18 it will no longer make sense but I could certainly use the excuse at the age of 5-6. One other note here was given my son’s October birthday, he was the youngest person in his class making my excuse even more plausible. He was socially behind by 3 years and was among children that were all older…..thus more mature……than him. My wife always questioned whether we should have kept him back a year before entering school but we always point to the fact that even as the youngest he is one of the smartest and already bored. How bored would he have been had we held him back. On to the 1st grade. Same struggles. Same ‘Gifted’ terminology was used to describe my son except this teacher was certain he was gifted. She was amazing and found ways to challenge my son to keep him interested. She would reward him by giving him more challenging things to do and she seemed to relish in the challenge that was my son. The last 2 months of the 1st grade were magical for my son. He had bonded with his teacher and every single day was a good day. I finally breathed a sigh of relief that everything was going to be okay. The new year arrived and my son entered the 2nd grade. Out of the gate, Jaden had a lot of struggles. My son does not do so well with change so we just figured and hoped he was in an adjustment period. He was very sad to be separated from his 1st grade teacher but we figured he would slowly get accustomed to his new classmates and his new setting. Some days were okay but we started to have more and more calls from the school office. Jaden was a little more disruptive and was not listening to the teacher. This time, the ADHD question surfaced but this time it came from the Vice Principal because every time she seemed to be at the school, Jaden was in the office in trouble for something. Again, my son is extremely smart and the ‘gifted’ term continued to be used but I started to fear something else was wrong. I felt and, while writing this post, feel like the pressure of this ADHD question has been building for years and I feel this insane weight on my shoulders awaiting the answer. When my phone rings at work and I see it is my wife calling, my heart rate goes through the roof at the fear of receiving some bad news about the trouble my son is having at school. This fear is not about the inconvenience. This fear is about my son and how all of this is making him feel. I have tried everything I can and feel like a failure because to date I am not making much progress for my son. Some situations at school recently forced us to get Jaden a counselor. This counselor has been seeing my son weekly for a month or two and last week’s session saw the doctor ask if I would attend my son’s session next Monday. My immediate thought was that he has finished his assessment and is going to diagnose my son with ADHD. My wife indicated he is leaning that way and it FREAKS me out. Don’t get me wrong, there are far worse things my son could be diagnosed with……..I have experienced that first hand on multiple occasions and I have witnessed it through friends and family many more times than that. My son could have cancer or some other debilitating illness and I would gladly choose an ADHD diagnosis if I had to. That being said, I took a quick glimpse at the internet and the brief things I read before running from the computer in a panic have me incredibly upset. I do not want my son to be labeled. I do not want my son to struggle. I do not want my son and will not let my son take medicine. If diagnosed with ADHD, Ritalin may be proposed as a solution but I will be sent to prison before my son ever touches that medicine. I have talked to people that have been around others taking Ritalin. These children were said to appear like a cloud had come over them and I even heard the word ‘zombie’ used. That will not happen to my son. I will quit my job and live in a box if I have to be there for my son. My wife has already quit her job, which will put a financial strain on the family, but I could care less. She can now be at Jaden’s school on a daily basis making sure that he gets through each day with success. It may be a temporary solution but at least it allows some time to figure things out. This may all sound silly to those of you reading this. I have cried (in full disclosure mode here) 5 times just writing about this. I do not know if it is sensitivity tied to already losing a child. I do not know if it is simply a father’s love for his child. All I know is that I am terribly upset and just want my son to be okay. How does Moneyball fit into all of this? To explain that, I have to back up to October of this year when I started running with my son. He was only 6 at the time so I would not let him run too far but I did give him the okay to train for a 5K. It was something we could do together. It was something I thought he could use to channel his energy. It was also something his 2nd grade teacher was very good at so I thought it might help my son to feel a connection. We started running with just a mile and even in that mile we used a run-walk interval. I did not have any time aspirations for my son. I just wanted to have fun with him. I would offer coaching suggestions but just so he felt good about himself and so that he felt like he was working towards something. He has seen me coach at Team in Training many times and now he was able to have his Dad as his coach. We had an amazing time. 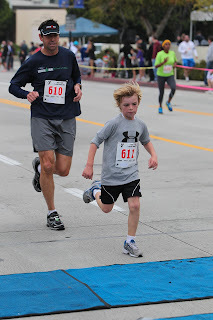 The Burbank YMCA Turkey Trot was his 1st 5K and we had a blast. I was so proud of my son. It was the first time he ran without stopping and he broke 30 minutes which was a target we threw out there for fun. After the Turkey Trot, my son took some time off for the holidays…..sounds funny I know but to a 7 year old (he turned 7 shortly after we started running on 10/29/11) Christmas was much more exciting than running. I think it was not until February 2012 that the talk of another 5K came about. I let Jaden choose a race and he picked the Agoura Hills 5K which was part of the Great Race of Agoura which features a half marathon, a 10K, a kids mile, a kids fun run and, of course the 5K my son would be competing in. We started training but it felt like we didn’t have too much time before the race would be upon us. I told Jaden we needed to get in 3 runs per week. I would give him 2 shorter runs and then one longer one of 2.5 to 3 miles. Up until this point in my son’s brief running career, I would have to spend a lot of time distracting my son from the actual run. I would get him to talk about toys and forget about running because he would get whiny and not really push himself if he thought about what he was doing. He had a great time but I think he was dramatic about it. Talking about Beyblades or Bakugans would allow him to pass the time before he realized he had actually run a few miles. It was not until training for this 2nd 5K that I could just run with Jaden without any mental tricks. Every once in a while I would have him do some running drills. It was fun for him because he got to sprint for short periods of time and it made him really feel like a runner…….kids just want to sprint! It is mid March and race day is approaching soon. I am flying home from a business trip and decide to watch the movie Moneyball on my iPad. While watching this movie a light bulb went off as to why I wanted my son to run and, truthfully why I think everyone should run. Approximately ¾ of the way through the movie, things turn to the Oakland Athletics attempt at the American League record for consecutive wins. This team that started the year playing horrible…..this team that was not expected to do much after losing some star players had won 19 games in a row. Nineteen games in a row is unheard of and absolutely amazing. I am no Oakland fan but I remember cheering for them as they chased this record. I am not sure if I cheered because they were the underdog (I am a huge fan of the underdog) or simply because I was a baseball fan but I do know the world looked on. On September 4, 2002, the Oakland Athletics were playing for the record 20 game streak. They started strong and took an 11-0 lead over the Kansas City Royals. It was only the 3rd inning and the victory seemed inevitable. Kansas City did not give up easily though and fought back scoring 5 runs in the 4th, 5 runs in the 8th and tied the score at 11-11 in the top of the 9th inning. The Oakland A’s has blown an 11 run lead which takes the game to the bottom of the 9th where Scott Hatteberg was brought up as a pinch hitter. Scott Hatteberg had a prominent role in this Moneyball season as the Oakland A’s picked him up when nobody really wanted him. It was a dramatic moment that ended in dramatic fashion when Scott Hatteberg hit a home run to end the game and secure that 20th consecutive victory. The movie does a great job of capturing the moment and I do not own the words to do justice to the chills I get each time I watch Hatteberg pumping his fist rounding the bases……that exuberant feeling as his teammates rush the field literally going insane. I have had those moments in my lifetime. I flash back to them as if they happened yesterday. I can remember every big hit or big moment I had that warranted a high five from my Dad. It is that exuberance…..that amazing winning feeling that running provides to everyone that gives the sport a chance. Whether you are the fastest runner or the slowest runner, crossing the finish line is a game winning home run. It is the end to a lot of hard work. It is the culmination of a journey that every runner and walker gets to experience and I so badly wanted my son to know what it felt like. I wanted him to know he was amazing and capable and a winner. My hope was that running with his Dad might lead him to this experience. Well, this takes us to March 24, 2012. It is the Great Race of Agoura and a very big day on many levels. I am coaching the Summer 2012 Westside Marathon team with Lori Jomsky and this was the day many of our amazing teammates would complete their very first 10K. It was the day they would put on a bib and a timing chip and cross the finish line to experience what it is like to win. This was of course also the day that Jaden and I would be running in his 2nd 5K. I really did not know what to expect. I did not want him to feel pressure to get a PR. I wanted to set up the day so that he was proud of himself crossing the finish line. As we were warming up to get ready for the start of the race, I stopped Jaden and tried to feel out where his head was. I told him that we should go have fun and just use a sub 30 minute time as a general guideline. My son had other plans. He told me he wanted to go for the personal record and, at that moment, I was just proud for his desire to do so. He was showing a belief in himself that was great to see. The gun goes off and the start of the race is actually downhill. Consistent with what I always say, I told Jaden that this was a gift and that we were going to take whatever gravity would allow us. To get Jaden’s PR we needed to keep a 9:10 pace and the downhill had us way ahead of goal early into the race. I did not want to tell Jaden how fast we were going because I didn’t want him to freak out. He was not working hard so I felt we were okay. The race continued and my hope was simply to make it to mile 2 before Jaden started to hurt or break down. As it turns out, this is exactly what happened. Mile 2 hit and I heard the first whines coming from my son. This is where I did everything in my power to distract him. I tried to remind him we only had one mile left. I tried to remind him we had run a mile together many times. I tried to point out other kids approximately his age so that he would stare at their backs and try to stay with them. I even risked telling him our average pace...8:08…far faster than he had ever gone before. I told him there was a slight chance at sub 8 (because we had picked up the pace) to which he said nothing. One might assume he didn’t care but I think that time sunk in because he held on strong. It was all working until mile 2.5 and then the whine got a little louder. Jaden wanted to hold my hand as we ran. I reached out to grab his hand, give it a little squeeze and then told him he could do this on his own. At about mile 2.75, my son got very grumpy. No matter what I said, he loudly replied ‘NO’. Literally, this was his reply to everything I said because he was feeling some pain. I was just running beside him trying to get him to stay tough. The pace was all his doing and not influenced by me. Despite the whining and the ‘NO’ chant, he kept going and we finally got close enough to the finish line that he knew where we were. As it does for most people, this sense of being close to the end provided some strength and he drove to the finish line. 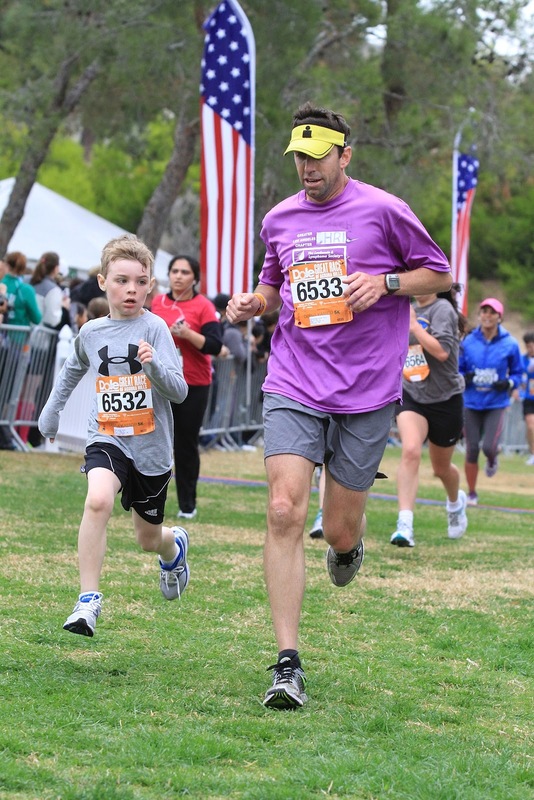 While I never stop the watch crossing the finish line…….this time I did because my son would want to know his time. I looked down to see we had averaged under 8 minutes for the 5K. My son closed out with a 7:40 mile, the fastest by far he had ever run. Two steps across the finish line, my son threw up a tiny bit. I upset someone for sharing that I felt proud of my son when I saw this but I am not here to impress anyone. That is exactly what I felt…..proud. I knew he was not hurt. I knew he would be fine. I also knew that my son had not held back. 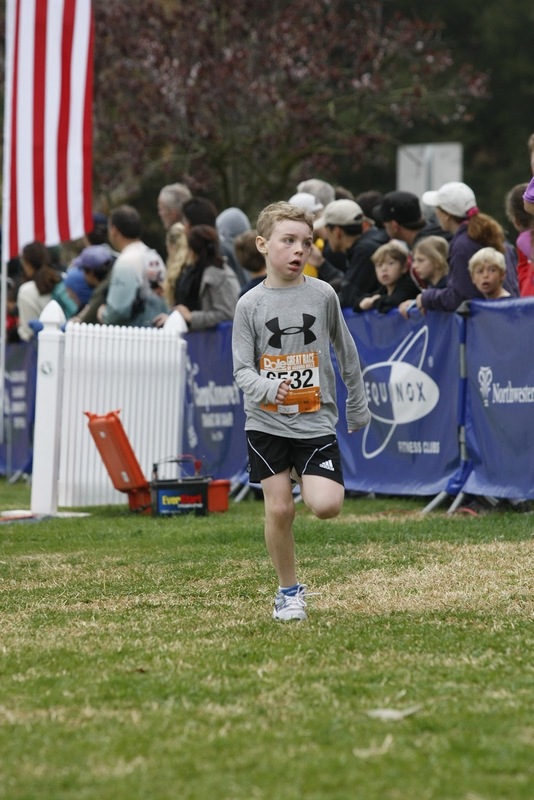 Jaden believed in himself…..he left everything out there on the course and that was an amazing moment for my son. I showed him the watch and could tell he was so proud of himself. It was the Scott Hatteberg, bottom of the 9th homerun I had hoped for. We picked up our medals……..very important to a 7 year old……and on the way to the car I stopped my son, made him look me in the eye and I told him to remember this moment. I told him to remember he is worthy and he is amazing and that he can accomplish anything in life that he wants to. I told him to never doubt himself for what he had just done was remarkable. For a little boy that doesn’t always focus, he did not take his eyes off of me. It was a moment I will always remember and, although he is young, I hope my son remembers it too. Today is Saturday, April 14, 2012. In two days, I have to go see Jaden’s doctor. I have no idea what he is going to say. I am afraid of what he might tell me because I never want my son to feel different or ‘less than’. I do not want a label to affect how my son feels about himself. As I said above, I do not want a doctor trying to push medicine on my child. I lost one child. I will not lose another one to medicine that changes who Jaden is. This leads me to the song Perfect by Pink. I have never heard Pink sing the song but I recently heard a rendition on television and the words struck home for me. If you ever ever feel like you're nothing…..you are perfect to me. To my son, I Love You and I Love who you are. You have the biggest heart in the world and we will figure things out. Your Dad has not always been the best Dad on the planet and you deserve that Dad. I have yelled more than I would like. I have showed less patience than I would like and less patience than you deserve. I have been getting better. I will try even harder and I can see over the past few days that we are making progress. Always know that you are absolutely perfect to me. Together we will work hard to make sure that you do great things with your life. First I'd like to congratulate Jayden for an amazing time. That's a time any adult could feel good about. We live by the open desert, my son had so much energy we took him on nightly runs just to burn some of it off. He ran his first race at 3. He was so little and it was a small race so everyone waited for him to finish. When he did and they cheered loudly when he crossed the line. He got a medal that day. I still have those little shoes. My son is also 2x, or twice exceptional, gifted with ADHD. I hated the thought of putting him on meds but he was out of control to say the least. I struggled for a long time with it until one day a doctor told me something that changed my perspective. I had always felt like you do now, that I didn't want him "drugged" or a shell of who he was. The fact is his ADHD was so severe that all of our time with him seemed to be negative. His doctor told me that I would not be quenching who Ben is but allowing him to be who he was meant to be. That made perfect sense to meand it was true. With the meds he could concentrate, follow directions, study and succeed. He graduated from high school 3rd in a class of over 700 people. He was on homecoming court, lettered in 4 different things activities. The meds were not a magic potion but it did allow us a way to help him. To teach him how to live with this disorder. If I could have kept him off the meds I would have but that wasn't the solution for us. Hopefully you can keep Jayden off meds but if not, it's not a failure on your part or his. You wouldn't deny a diabetic insulin, right? ADHD is very common and it's no longer considered to be a failure on someone's part. Adam Levine, from Maroon 5 is ADHD, Wynonna Judd, Jimmy Fallon, and many other stars, athletes and people of note are ADHD. It's not a curse, but it can be a set back. People with ADHD are some of the smartest, most creative people the world has ever know. I know the fear of having a child labeled but in the end we did what was best for him. Don't be scared for him. Take one day at a time and let God lead you in wisdom. Ask Him for wisdom. If you can stay off the meds that's great. If not, it's not a failure on your part. It's giving your child the help he needs to be successful. He may also benefit from being in a gifted program. My best friend's son is almost 11 and has ADHD. She was determined not to medicate him because she didn't want him to lose his sparkling personality. When it began to really interfere with his ability to learn in school (since he couldn't sit still long enough to focus on the lessons), she finally agreed to try medicine. It took some experimenting and there have been a few prescription changes along the way, but now her son can actually sit still long enough to actually use the analytical, thinking part of his brain. He will sit and read a book for 30 straight minutes, and absorb it all. He's no longer failing tests because he didn't pay attention -- he always had the smarts but got distracted. There are many alternatives to Ritalin, and the key is to watch for changes and go back to the doctor if anything isn't right. Jaden doesn't have to become a different person. And congratulations to Jaden on his race! You better watch out, or soon you won't be able to keep up with him. I absolutely urge you NOT to put your son on any form of medication. You are 100% correct that you would do anything besides put him on this -- quit work and live in a box as you said. Children die from psychiatric drugs every year. It is horrible and it is murder. There is a group that can help you, the Citizen's Commission on Human Rights (www.cchr.org) they can help you fight these people who are trying to drug your child. There are many natural remedies and so many times what is called ADHD is just a child being CHILD! Do ask CCHR for help, there's definitely something that can be done about your child and you are doing a GREAT job so far yourself if you ask me! I would highly recommend reading "Gut and Psychology Syndrome" by Natasha Campbell McBride. Love to you and your family.